This composition for 5 wind instruments and soloist explores interplay between structure and freedom. It is based on an 11-tone harmonic complex and a series of tonal effects serving as ensemble interactions with the soloist. The role of the soloist is entirely improvised. The soloist can conceivably be any instrument. Additionally, the soloist does not have to be limited to one musician. It can be expanded to multiple musicians -- up to the size of a small band (any genre). Any creative possibility can be explored. I envision this composition as being a framework for a collective creative process to take place between the soloist, conductor, and ensemble. In this way, the score is a point of departure for wherever the musicians want to take the music. Flexible instrumentation is used to enable the music to be played by many combinations of instruments. Mid-Size Ensemble describes the concepts I used in this piece. Note: Smaller Ups And Downs does not have a set of parts. 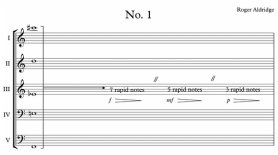 Since this piece is instruction-based and has minimal music notation, performers use individual copies of the concert pitch score and transpose their notes. See the Performance Notes below for more details about this piece.